Another project from the "Writing and the Visual Arts" program was these Aztec File Folder books. I'm always amazed with the possibilities of these books and it seems every teacher I introduce them to begins seeing all the applications they can use in the classroom. Now don't freak out with the supply list. 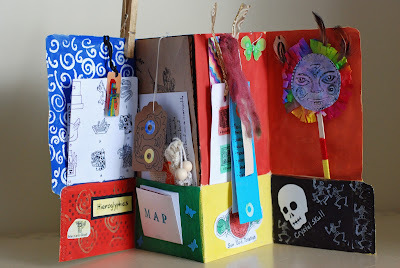 This just lists what I used to make this book but you can use what you have on hand and modify as you need to. As always it's a work in progress! We need to re-fold the folder otherwise our book will be uneven. Take one end of the folder and match up the tabs on the side so they are even. You will then have to make a new fold line. 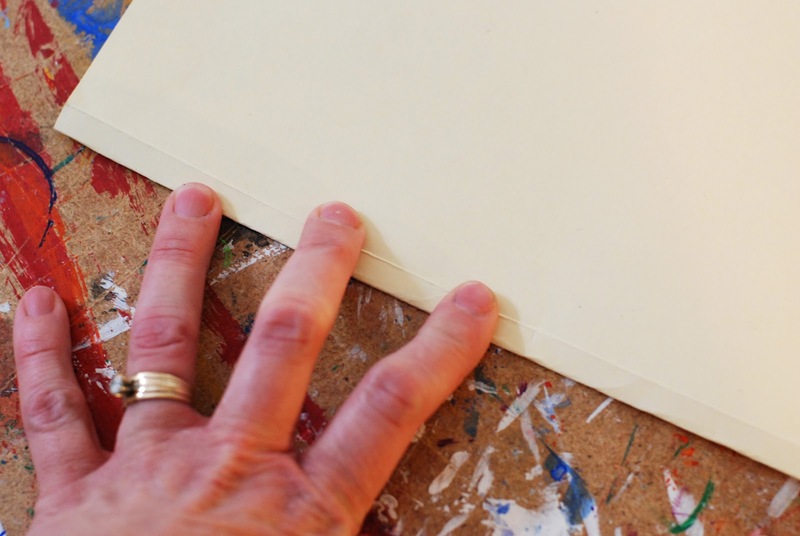 Use your finger or a ruler to make a nice flat fold. Open up the folder again. 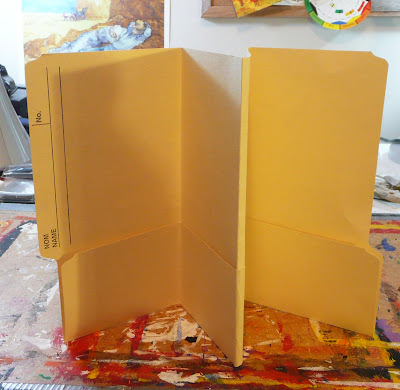 Fold the bottom edge up so that the bottom edge of the tab on the right meets up to it's top edge. Use your finger or a ruler to make a nice flat fold. Now we need to make our accordion folds. 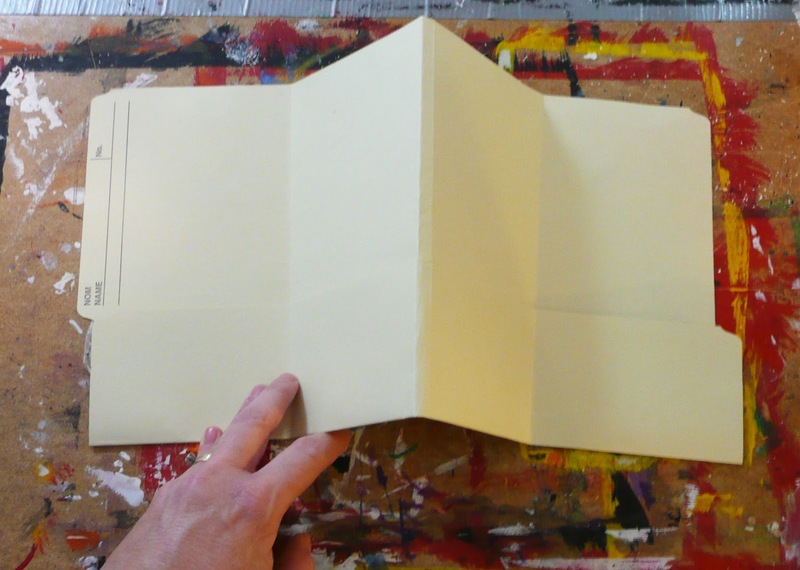 When making these folds forget about the side tabs. 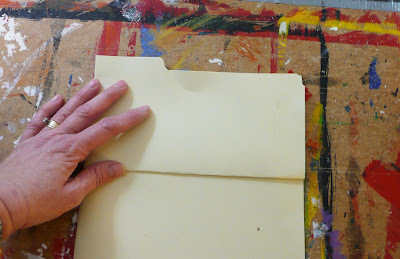 You want the main body of the folder to match up with that new fold line you made in the center. Open up the folder and unfold the bottom. You want to put some glue on each vertical fold line on that bottom section including the 2 sides. I like to sew my 2 sides but that is optional. 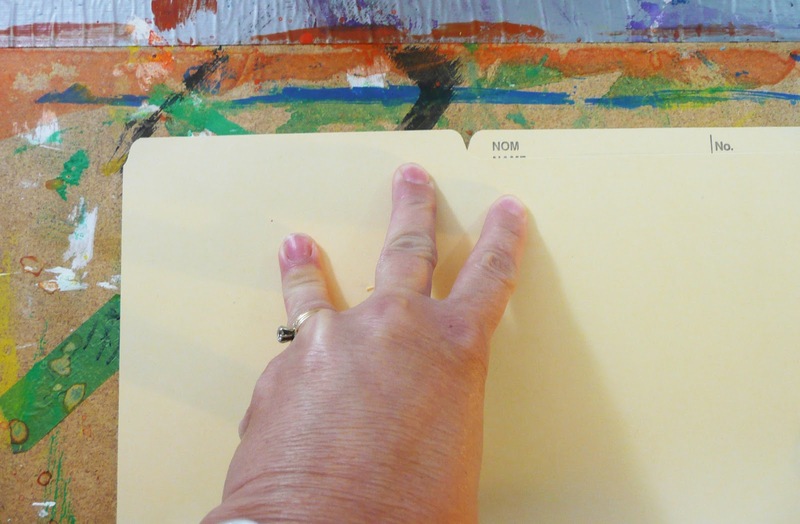 Now you know how to make the basic file folder book. For the Aztec book we started by painting our inside with disk tempera paint. 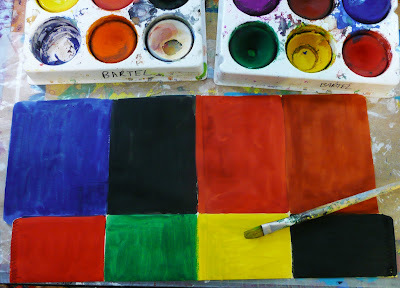 I like to paint the pocket part different from the page. Now on to the front and back covers. Turn the folder over. The far right hand side is the front cover and the far left is the back cover. Using acrylic paint we painted the front and one of the middle sections turquoise. 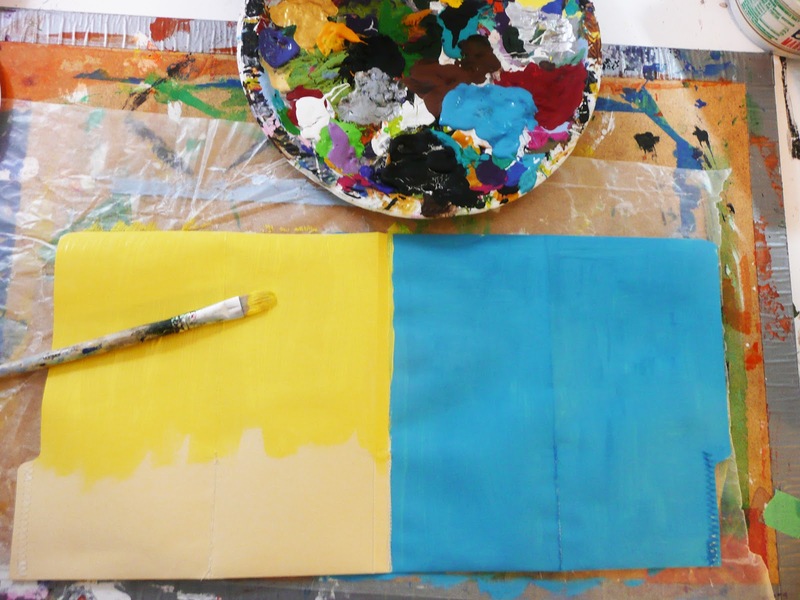 The back cover and other middle section we painted yellow. 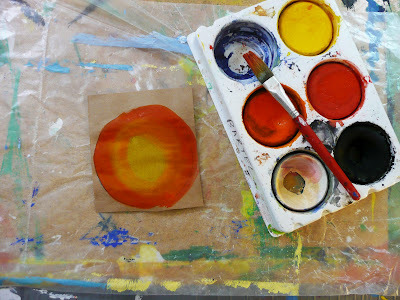 While the book is drying we worked on our Sun stone that will grace the front cover. Take a square of kraft paper or brown paper bag. It should be no wider than the front of the book. Trace a circle on it. I used a masking tape roll. Paint in some sun colors with disk tempera. We are going to make stamps using craft foam. Draw a circle onto your craft foam. Mine is about 1 inch smaller than my kraft paper circle. Using a pencil draw out your design onto the foam. Push down fairly hard to indent the foam but not enough to poke a hole in it. Now you can use these clear acrylic blocks if you have them or just some thick cardboard. 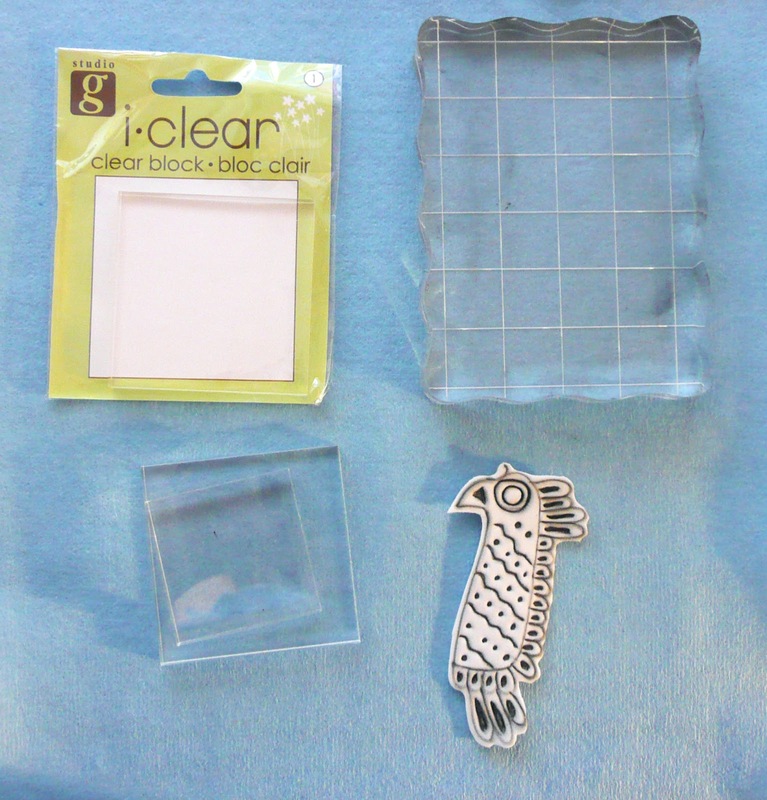 I buy some of the small squares every time I go to Michael's as they are usually under a $1.00. I now have a class set. 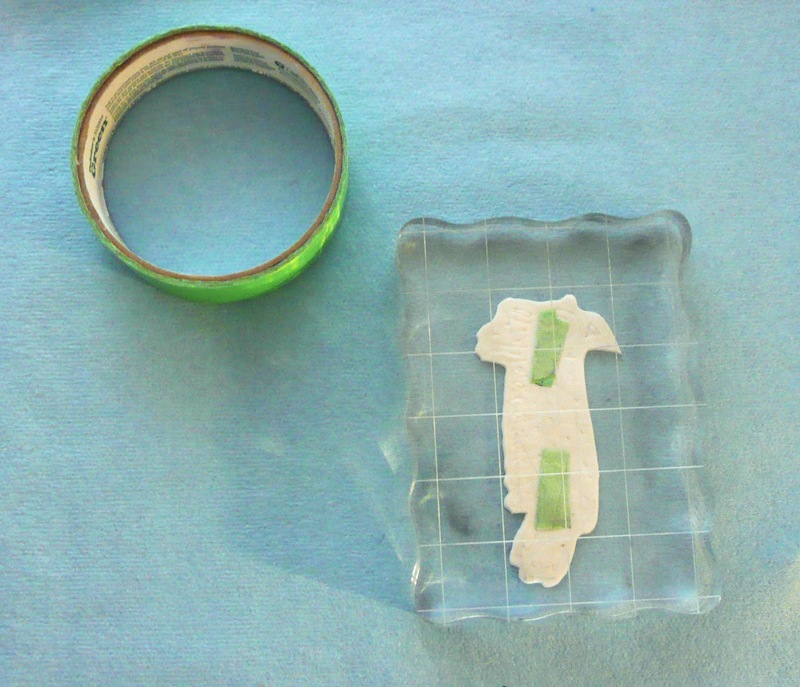 The advantage of the clear block is it allows you to see exactly where you are making the print. 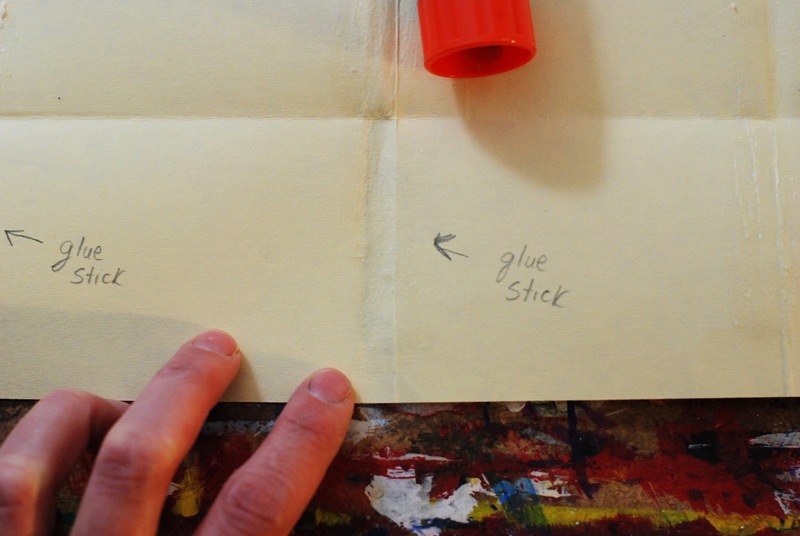 Tape on the stamp to the block or your piece of cardboard. 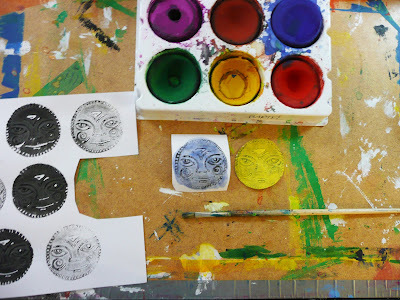 Paint on a little liquid tempera onto the stamp. Have some paper nearby. 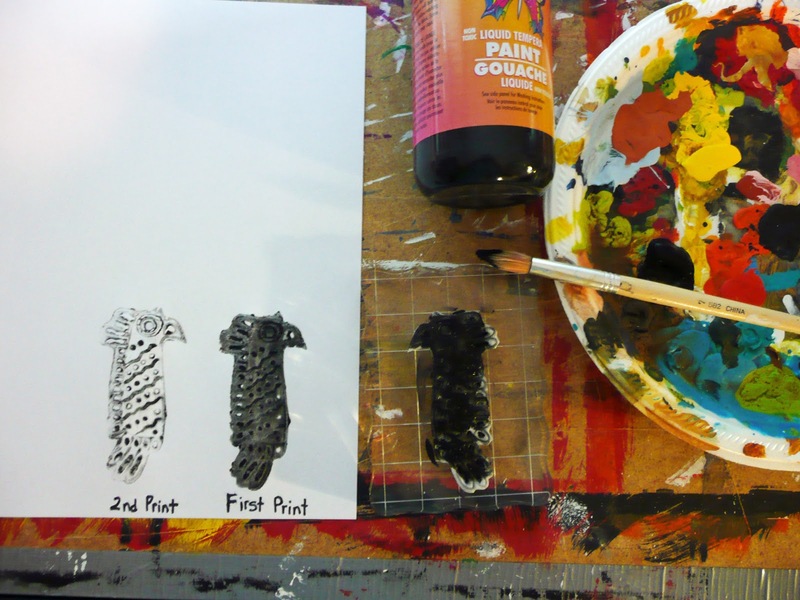 The first print is usually too dark and you want the second one. 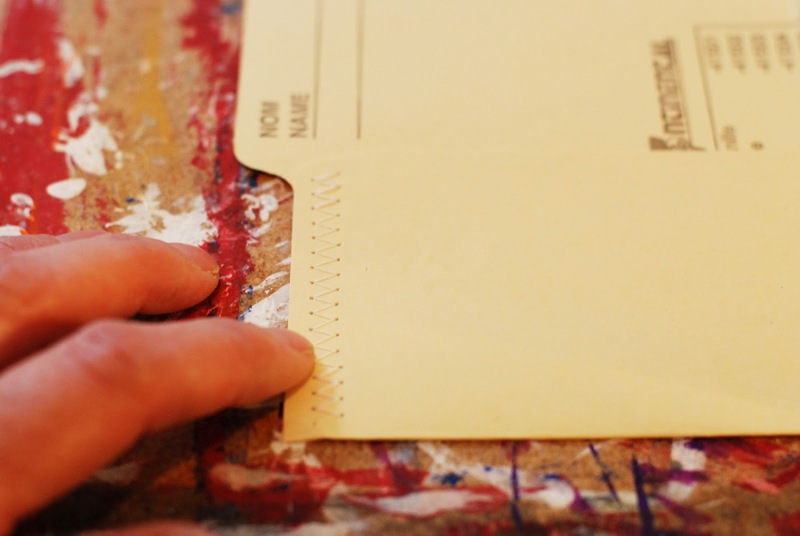 Stamp one of those second prints onto your painted kraft paper. While you have the paint out stamp a few extras onto the paper as we will use them to make our fan. Using a little piece of cardboard you can add some rays to your sun and some dots with the end of a pencil dipped in paint. 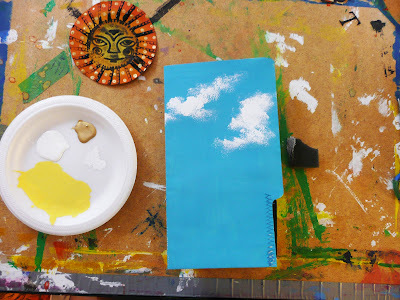 For the front cover I want the sun up in the sky so I add some clouds with a sponge dipped in white paint. Let the clouds and sun dry. Before gluing my sun on the cover I added some extra rays onto the blue paint. 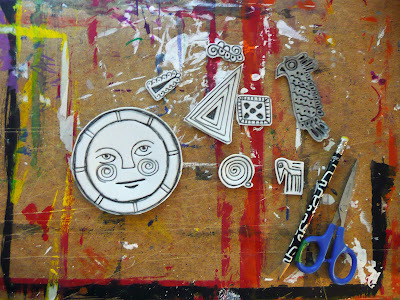 I glued on the sun with tacky glue. I stamped on the word CODEX as that is what Aztec books are called. Basically any book that has pages is called a codex. 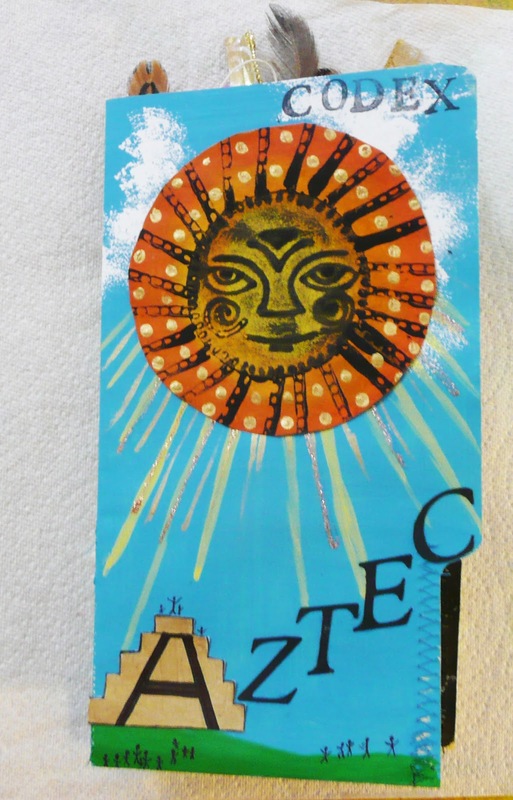 The Aztec books were early examples of a folded codex. I used an 'inchie' and made a stepped pyramid which I painted gold and then added an "A" to it is sharpie. I added the other letters for "AZTEC". I painted in some ground in green and a few stick people. The inside of the book can be as elaborate as you want. This is where all your info will be stored. 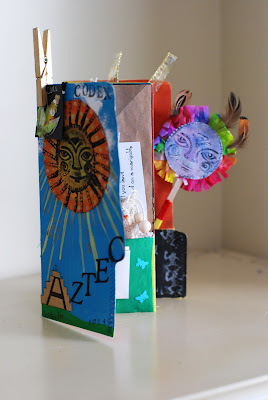 For our Aztec one we had sheets of hieroglyphics, maps, a Patolli game, tags, bookmarks, and a mini fan. I won't go thru everything but here are some highlights. 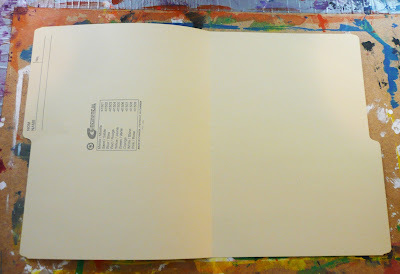 For the second page we added some stencil. 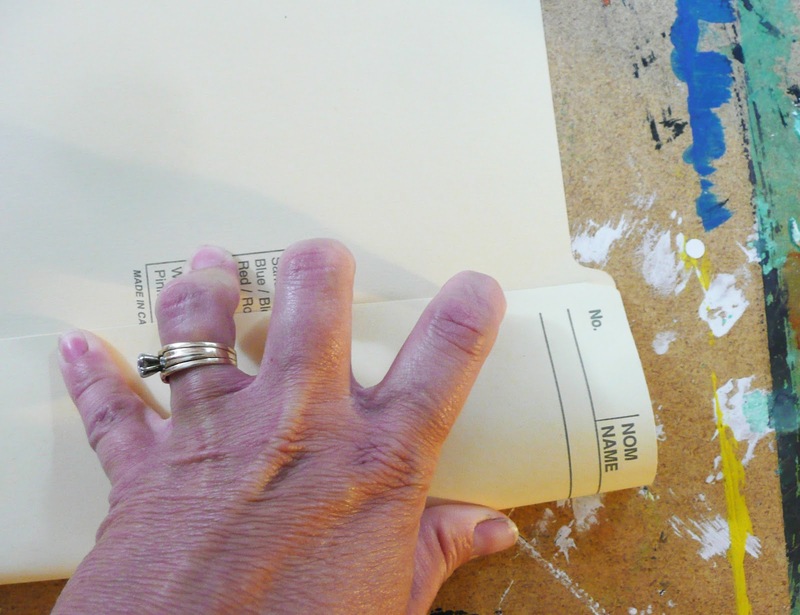 Lay down a homemade stencil or bought one and pounce on some paint. I often save the leftover sheet from cutting with the cricut for stencils. For the mini fan. Paint 2 of the extra prints you made and cut them out. 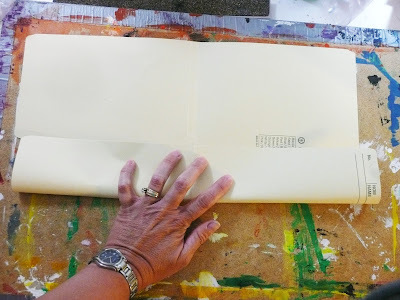 Take a strip of tissue paper about 1 inch wide. Cut in a fringe. 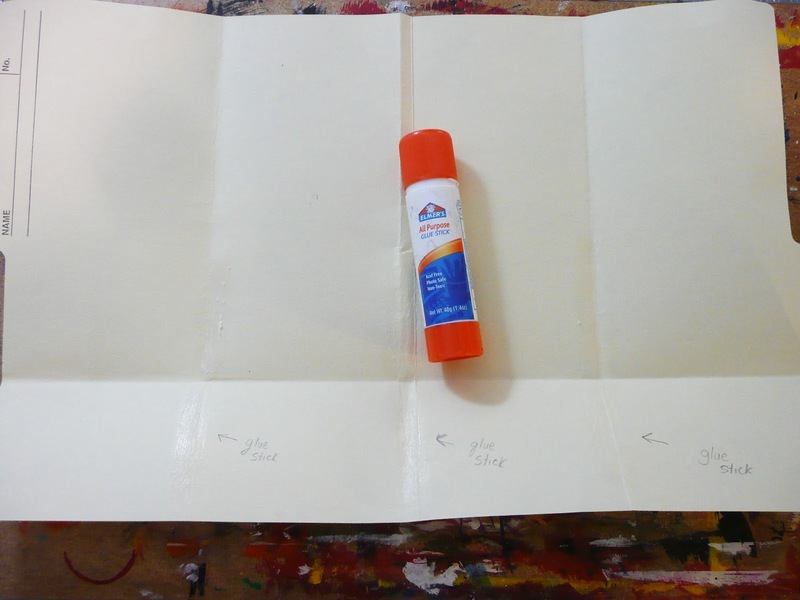 Apply some glue on the back of one of the prints and press the tissue into the glue gathering it here and there. You can add a few feathers if you want. 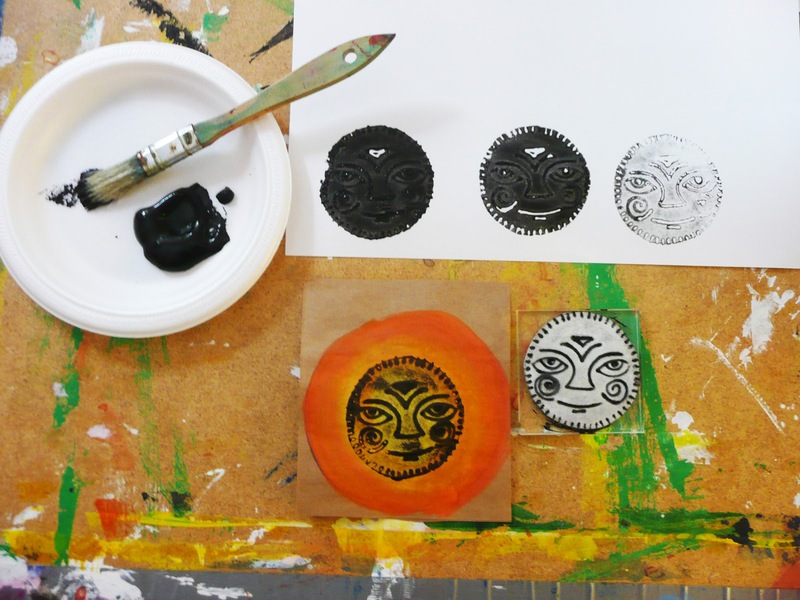 Put a long coffee stir stick in the middle, add more glue and then put second print circle on top like a sandwich. I wanted to add some interest to the stick so I tied on some embroidery floss, spread a little tacky glue on the stick and then wound the floss around. The last thing I want to show you is the back cover. We did an eggshell mosaic of the double headed serpent. I describe the technique in this post. Basically you collect some eggshells and you can either paint them or dye them. I always keep my Easter egg or Pysanky dye thru the year. 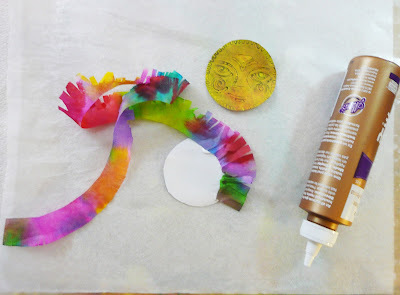 You can make amazing dyed papers with it by the way. Cut out a base shape out of cardstock. It will show up like the grout in the mosaic so pick a color accordingly. Lay it on some wax paper. 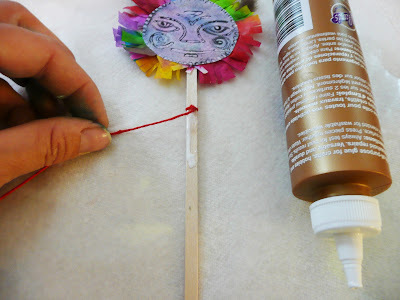 Brush on a little Mod podge or tacky glue. 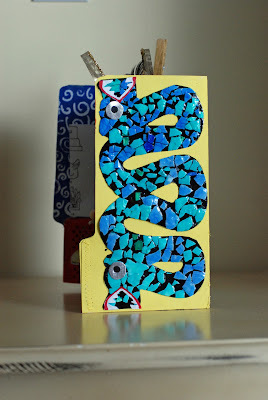 Take a thumb sized piece of shell, place onto the Mod podge and then squish it down with you finger. Continue until you have covered your shape. Don't worry about going over the edges you can trim that with scissors when dry. 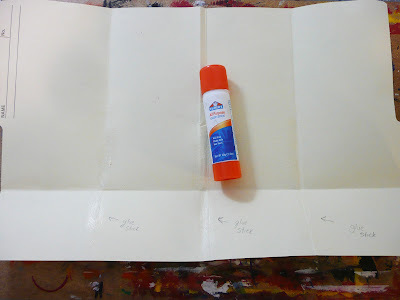 When the Mod podge or glue has set up enough on the bottom add a top coat. If you do it too soon all the eggshell will move around. Let dry, remove from wax paper, trim any excess. 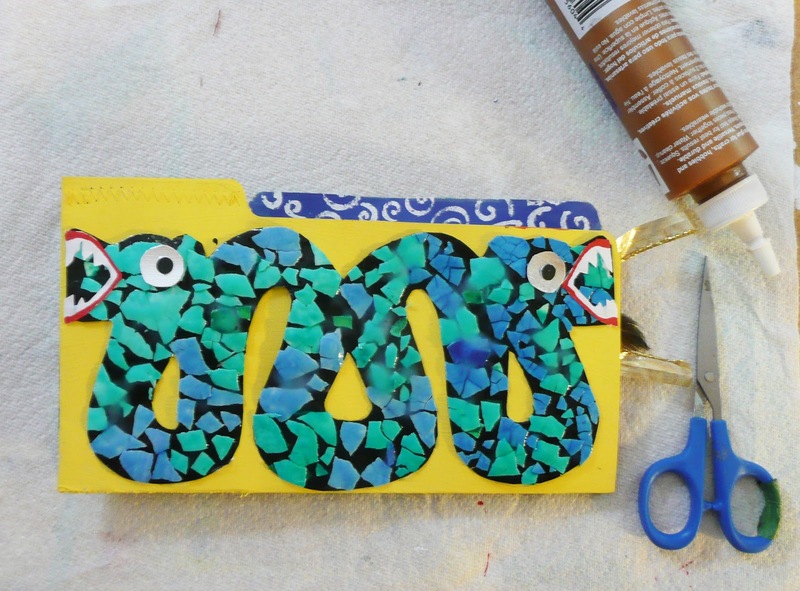 glue into place on the back cover and add teeth and eyes. For the kids, we cut out the mouth something I neglected to do in the sample. That's it. You can paint a clothespin to hold the book closed or to hold extra info and art. You can continue to add to this book as you go along. This is an awesome "show & tell" Gail!! I am always fascinated by your projects and I thought that TODAY might BE the day I take a moment to tell you so. I'm pretty sure this is something I will find a way to use. Sure DO wish I had known of it when I was still teaching, but as I am noodling back into things, I really like this as a project. I bet other teachers are finding great applications, and I have to say that YOUR posts have really inspired me to get a little more "out there" with my ideas!! i love these books!! we used them to tie up a unit on the moon we did in school this year. LOVE them!